"I have a bad habit of punishing myself when things are going bad, because I think they're not going bad enough." According to the documentary Benjamin Smoke, the Cabbagetown area of Atlanta is a seedy, disheveled and dangerous neighborhood, once home to immigrant families who worked in the mills, but now just a dirty, crime-infested grid of streets full of ramshackle homes. In this stunning and heartfelt film from filmmakers Jem Cohen and Peter Sillen, we are thrust headfirst into the world of Cabbagetown resident Robert "Benjamin" Dickerson, a drag queen/poet/musician battling not just his creative demons, but the double-edged sword of drug addiction and AIDS. 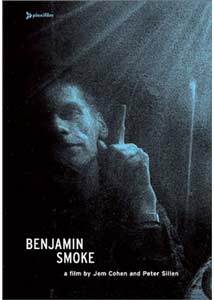 Benjamin Smoke was shot over a ten year period, and the film has been assembled without any type of formal narrative. The back-and-forth of the timeframe is not really an issue, and Cohen and Sillen have edited their project with a arty and stylized haphazard air of disorganization that certainly befits their subject. Dickerson, seemingly under the influence of the pills he so lovingly refers to, rambles on with a string of bizarre and occasionally clear-cut streams of thought as he recounts various episodes of his life. His comments on analyzing the durability of cheap sunglasses reveals the kind of subtle poetic edge that would come through via the music of Smoke. The tranquilized Dickerson comes truly alive during the sequences where Cohen and Sillen capture the band performing live. The five-piece band, featuring cello, guitar, drums and trumpet, become a sort of alt-goth-chamber ensemble, led by the dirge-like growl of Dickerson, who has a wonderfully smoky voice that brings to mind a cross between Nick Cave and Tom Waits. The performances seem to obviously give Dickerson focus, and seeing him channel himself that way it really appears that the band Smoke existed specifically for him. Rock legend Patti Smith appears briefly here, referring to Dickerson's "distorted and contorted energy" with a tone of sincere reverence, and as we catch glimpses of fragments of performances we, the viewer, are left with the same impressions. The story of Dickerson and the band is at once odd and incredibly sad. While it is clear that his drug addiction keeps him in what appears to be a constant (though undeniably lucid) haze, it is those brilliant moments when Smoke's music is featured that reveals just how powerful and emotional their songs are. Fans of adventurous music, like my wife and I, will be puzzled and confused at the nonsensical reasons why a band like this never achieved greater success. Even with high-profile admirers such as Michael Stipe and Patti Smith, it seems now that their best chance of exposure will ultimately be from this unusually striking film. Image Transfer Review: The documentary itself, which alternates between black & white and color, was shot on a mixture of 16mm, video and Super 8, so the image quality varies greatly. Some of the black & white sequences are downright stylish, with a dramatic contrast between blacks and grays. The film is presented in 1.33:1 full frame, with any grain more likely a result of intended effect by the filmmakers than any flaw in the source print. I didn't notice any glaring nicks or blemishes. Audio Transfer Review: The 2.0 English surround track is a deceptive one, because much of the film consists mostly of various snippets of Benjamin expounding on this subject or that, and being simply one person speaking the audio quality is decent but certainly not spectacular. It is, however, the musical performances, especially the live songs performed by Smoke that reveal a noticeably clean mix. The rears channels fill out the sound stage with subtle cues, and the front channels offer a distinct and surprisingly spacious instrument separation. Extras Review: The only way the supplementals could have been any better would be the addition of a commentary from directors Jem Cohen and Peter Sillen, especially considering this documentary was shot over a period of ten years. But that's really a minor grip, because what is here is really quality stuff. A total of twelve disparate deleted scenes (available individually or via a Play All option) runs 47m:01s, and is a combination of musical performances and comments from Benjamin that run in the same sort of disjointed narrative that the feature does. The segment is highlighted by a truly goosebump-raising performance of From Fur City by alt-folk goddess Cat Power (aka Chan Marshall). The disc is cut into 18 chapters, and does not feature any subtitles. Drug abuse and rock and roll genius have long been bound hopelessly together in some sort of sordid, sick relationship, with so many undeniably creative types handcuffed by their own addictions. Here, we are treated to the compelling story of Robert Dickerson, a pill-popping drag queen with a penchant for darkly insightful songwriting and a haunting voice. This is a hypnotic and memorable film, one that is speckled with Smoke's Southern Gothic alternative chamber music and the deep, unforgettable growl of Robert Dickerson. More importantly, this is a celebration of raw underground music working to rise out of the unforgiving clutches of AIDS and addiction.